hotel experience in the heart of Hydra. I spent three nights at Piteoussa Guesthouse at the beginning of May. The place is located few minutes from the port and therefore it is pretty calm and quiet. Rooms are very nice and wide, with all the necessary comfort and modern furniture. I recommend it for a pleasant stay in Hydra. This hotel is such a cute find. It is in a great location, not too far from the port. The room seemed very clean. The décor and furnishings seemed brand new. I believe it was recently redone. We stayed in March 2018. Hydra was quiet (except for the roosters crowing and church bells ringing). The host was extremely cordial and even took the time to provide a map and recommendations for food. He even worked with us when our plans got changed.This place is really unique. Located on a super cute and quiet street. Yiannis was welcoming and accommodated our travel schedule with an early check-in and late check-out; he also recommended some places to eat, and had info about hiking when we asked. The room was spacious and comfortable. The Apivita toiletries were a nice treat, and much appreciated after a long day outside! The Wifi worked perfectly and we enjoyed our little balcony. Our only regret is that we could only stay for one night! We loved staying at the Piteoussa. The staff couldn't have been more friendly, it is run by a lovely man who gave us great tips for things to do on the island. It was excellent value for what we paid, we had a great ensuite room which was very clean. Location was ideal, 5mins walk to the port. Overall highly recommended. The Piteoussa is a sweet little guest house just a few minutes walk from the port. The rooms are lovely with comfy beds and crisp white sheets, and you'll find a nice hot shower with great water pressure. It's a quiet location, however the neighborhood kids can be loud when they play, so bring earplugs if you want to catch an afternoon nap (same goes for roosters in the early morning hours.) We enjoyed relaxing on the shaded patio and watching the donkeys go by. Owner Yiannis could not have been kinder or more welcoming. He works hard to make sure his guests are happy. Stay here - you won't be sorry. Hydra is a magical island! One of the most clean and comfortable room that I have ever been. The owners are a very kind couple even though the local people are not at all. Also they were willing to help us stay one more night due to α strike of the port officers. We absolutely recommend it!!! Nice spot up the hill from the port area...about 300 yards....All visitors to Hydra should be aware the roosters in the surrounding area/hills are up at 5 am, the ferel cats active and wheelies being pulled down the cobblestone streets noisy....so consider asking for an interior room. Ours had a nice view but there was a tradeoff.. Summary...we realy liked the Piteoussa...good value, good location, nice owners...clean. The rooms were clean and spacious. Towels changed every day. Gave us towels for the beach. Had our private terrace and had our breakfast there. Five minutes walk from the harbour. The owners are very friendly and helpful. 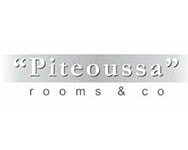 Choose Piteoussa for your stay in Hydra. Welcome to the Piteoussa on the beautiful Greek island of Hydra, the most exclusive and unique of the Saronic islands of Greece. Το μεγαλειώδες μικρό νησί της Επανάστασης και του διεθνούς τζετ σετ.